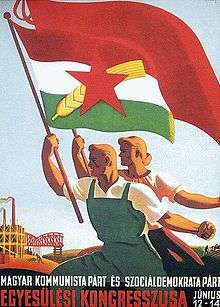 The Hungarian Working People's Party (Hungarian: Magyar Dolgozók Pártja, MDP) was the ruling communist party of Hungary from 1948 to 1956. It was formed by a merger of the Hungarian Communist Party (MKP) and the Hungarian Social Democratic Party. Ostensibly a union of equals, the merger had actually occurred as a result of massive pressure brought to bear on the Social Democrats by both the Hungarian Communists, as well as the Soviet Union. The few independent-minded Social Democrats who had not been sidelined by Communist salami tactics were pushed out in short order after the merger, leaving the party as essentially the MKP under a new name. Its leader was Mátyás Rákosi until 1956, then Ernő Gerő in the same year for three months, and eventually János Kádár until the party's dissolution. Other minor legal Hungarian political parties were allowed to continue as independent coalition parties until late 1949, but were completely subservient to the MDP. During the Hungarian Revolution of 1956, the party was reorganised into the Hungarian Socialist Workers' Party (MSZMP) by a circle of communists around Kádár and Imre Nagy. The new government of Nagy declared to assess the uprising not as counter-revolutionary but as a "great, national and democratic event" and to dissolve State Security Police (ÁVH). Hungary's declaration to become neutral and to exit the Warsaw Pact, caused the second Soviet intervention on the 4th of November 1956. After the 8th of November 1956, the MSZMP, under Kádár's leadership, fully supported the Soviet Union.